All of our efforts are with the goal of making women’s lives visible, because invisibility is the number one form of bias. MacGregor did not know the answer. After school that pivotal day, MacGregor consulted her college history textbooks for an answer. “Only one chapter in one book contained information about the first Woman’s Rights Convention in Seneca Falls, New York, in 1848,” MacGregor said. “I had read it before—I received straight A’s in history—and yet somehow I had not remembered it. I had not even realized how much I owed those women. For me, that was the beginning. It was the beginning of MacGregor’s realization that women’s narratives had been left out of history books, classrooms, and the media. Women were invisible because their stories had not been told. It was oppression by omission. MacGregor’s “conversion moment,” spurred by one student’s question, was ultimately what sparked MacGregor’s co-founding of what are today two national icons: The National Women’s History Project (NWHP), a nonprofit educational resource and clearinghouse for multicultural women’s history, and National Women’s History Month held annually in March. MacGregor was also a volunteer on the Sonoma County, California Commission on the Status of Women. She spearheaded the idea of a Women’s History Week for county schools. Curriculum guides were created and a celebratory parade was organized. “We provided resources, and the teachers could really teach it,” MacGregor said. “It was a way to introduce teachers to information they didn’t have. Professional women were recruited to visit schools. Teachers set the scene saying, for example, “Tomorrow we’re going to have a visit from a dentist.” The next day, a woman would enter the classroom, and the students would be taken aback—the dentist was not a man. 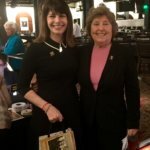 The first Women’s History Week was a success, and MacGregor was hired as projects director for the Sonoma County Commission on the Status of Women. 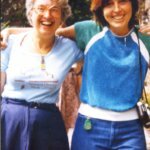 In 1979, with the impetus to promote a National Women’s History Week, MacGregor attended an invitation-only, 19-day Women’s History Institute for Women Leaders held at Sara Lawrence College in Bronxville, New York. Dr. Gerda Lerner was chair of the institute. Lerner is credited as the single most influential figure in the development of women’s and gender history since the 1960s. “When I received the invitation I was speechless, overwhelmed, and completely intimidated,” MacGregor said. Conference attendees included acclaimed women who were presidents of national organizations such as the Girl Scouts of the USA, National Organization for Women (NOW) and the American Association of University Women (AAUW). “I was one of the youngest people there, and I was not an academic,” MacGregor said. Again, MacGregor’s mission to promote women’s history took a giant leap forward. MacGregor presented her idea of a National Women’s History Week, and the Women’s Institute passed a resolution calling for its establishment. The participants immediately began using their organizational skills and political connections. Women around the country petitioned their governors to declare the week of March 8 as Women’s History Week. Barbara Omalade wrote an article about the Institute for Ms. Magazine and included MacGregor as a contact for materials to promote the week. The grassroots movement spread. MacGregor received hundreds of requests. Then she received a call from the White House. President Jimmy Carter issued a Proclamation calling on the American people to pause and remember the tremendous contributions of American women and declared March 2-8, 1980 as National Women’s History Week. The next year, Sen. Orrin Hatch and then-Rep. Barbara Mikulski co-sponsored a congressional resolution proclaiming Women’s History Week. 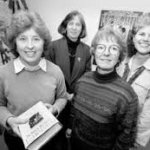 Also in 1980, MacGregor and four others formed the nonprofit National Women’s History Project in Santa Rosa, California, offering resources and knowledge to lift the stories of women’s contributions out of the shadows. Today, the NWHP is known nationally as the only clearinghouse to provide information and training in multicultural women’s history for educators, organizations, parents, and others. Lilly Ledbetter, Equal Pay Activist, and Barbara Hackman Franklin, former Secretary of Commerce, are among this year’s thirteen honorees. Open to all, an honoree luncheon will be held in Washington D.C. on March 25 with tickets available on the NWHP website. First Woman is available as an e-book for $4.95 at www.nwhp.org. It will be available in print in early 2017. 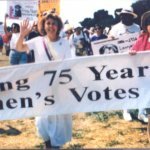 From the day 45-years ago when she searched her college history books to find information about the Women’s Movement, to 2016 when she led the NWHP to publish First Woman, MacGregor, 70, continues her quest to render women’s contributions visible. This article originally ran on the Ms. Magazine Blog on December 27, 2016. Author Angie Klink with Molly Murphy MacGregor, Co-Founder and Director of the National Women’s History Project (NWHP), 2016.